Putting people first – that’s what sets us apart. At Providence Health System, we honor the worth and dignity of every patient, and we extend that respect to the thoughtful, talented people who work here because we believe that’s what healthcare is meant to be. Providence Health System is a not-for-profit organization extending across a four-state area – from Alaska through Washington, Oregon, and into Southern California. 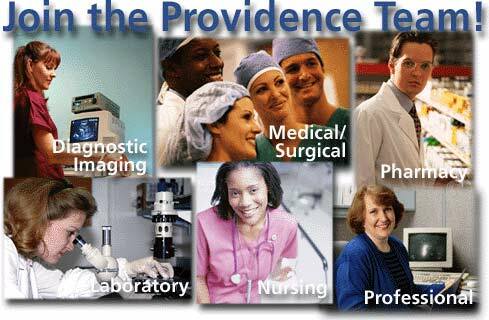 With 32,765 employees, Providence Health System operates 17 acute care hospitals, 12 freestanding long-term care facilities, and 19 low income and assisted living facilities. Our award-winning acute care hospitals are consistently recognized for excellence in patient care, including cardiac, cardiovascular, obstetrics, respiratory and stroke care. The system also operates comprehensive homecare and hospice services, primary care clinics, and educational facilities. Providence Health Plans cover more than 736,000 members. Providence Health System continues the healing ministry of Jesus in the world today, with special concern for those who are poor and vulnerable. Working with others in a sprit of loving service, we strive to meet the health needs of people as they journey through life. Our mission is carried out by employees, volunteers, physicians and others working together in the spirit of our core values – respect, compassion, justice, excellence and stewardship. Careers at Providence are rewarding in countless ways. Every day is an enriching one for those who work here -– whether it’s by excelling in a challenging profession, or working with a team of extraordinary individuals who share the same spirit of dedication. Here, people come first, and that is evident in our respect for one another and our compassion for our patients. Providence Health System recognizes the value of great employees, dedicated to growing a diverse workforce, and offering competitive wages and health benefits. If you live in one of the communities below, come explore JOB OPPORTUNITIES at our hospitals. Learn how to prepare yourself for a rewarding career in health services. Teens should consider VOLUNTEERING with us to gain experience that will last a lifetime.